Follow me on twitter: http://twitter.com/LindaDee for music news among other things! Alan Jackson - Where Were You (When the World Stopped Turning)? Antioch Community Church - Restoration; So Good to Me; Break Every Chain; What Does It Sound Like? Desire Worship Band - God Of My Life, Beyond Words & others from album "Face First"
Godfrey Birtill - R U Ready? Karen Peck & New River - Four Days Late; Why Can't All God's Children Get Along? Roma Waterman - Breathe It In; Roma Waterman & Dave Fitzgerald - Hallelujah, He's Alive! Todd Agnew - Joy Unspeakable, Did You Mean Me? Tom Frye - Where Is God? Take a look at this! Our friends, Anthony & Irene, were on the Israeli news with this song! Add them as your friend! CompassionArt Project being recorded at Abbey Road Studios to benefit the world's poorest of the poor. 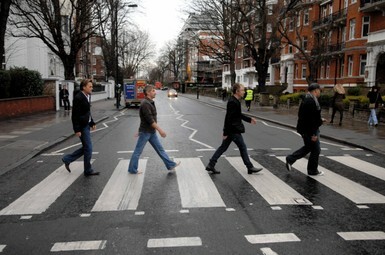 Pictured above: Michael W. Smith, Paul Baloche, Martin Smith & Israel Houghton. RELEASE DATE IS 1/27/09! * Be inspired! Check out worshiptogether.com and watch the New Song Cafe' video for the week! Also, free sheet music! * Hillsong United has posted two videos for their project, The I Heart Revolution. Click here for Preview 1 and click here for Trailer 2. Tune in for a fresh new Showgrams with DJ Scotty Does every Monday night!!! Our hearts and prayers go out to the family of Steven Curtis Chapman in the tragic death of his 5-year-old daughter, Maria, on May 21, 2008. * ANTHONY JAMES & REAL LIFE RADIO EXTRA HAS TAKEN A BREAK FOR THE SUMMER! * Check out both our weekday & weekend broadcast schedule posts! * Faith4, a new indie band, donates 100% of the proceeds of their new album "I Believe" to the Troops for phone cards! Check out their website, faith4.net !! WE WANT SCOTTY DOES!!! What happened a little outdoor NHL game did him in? God bless you all. I listened to Johnny Anonymous! It was da bomb! !